The National Science Foundation has awarded University of Dayton associate professor of biology Tom Williams an $839,000 grant to research how evolution used so-called ?genetic switches? to develop biological diversity. Williams studies fruit flies to understand why members of divergent species that share the same genes look and behave differently, but the findings could have implications for human health. The grant, Williams’ second from the National Science Foundation since 2012, is one of the largest awarded in recent years to an individual researcher in the College of Arts and Sciences. It will allow him to continue his research with a laboratory staff that includes two doctoral students and eight undergraduates. Williams is an evolutionary developmental — or “evo-devo” — biologist. His research is rooted in 1980s discoveries that found radically different organisms have similar sets of genes, suggesting much of the Earth’s biological diversity comes not from new genes, but from how the same genes are used differently. Under his previous funding, Williams developed an investigative model using color patterns on the abdomens of fruit flies to study the ways in which DNA sequences function to switch genes “on” and “off” during an organism’s development. Despite sharing common ancestors and physical traits, fruit flies’ color patterns are changing rapidly in evolutionary time to help them adapt to their current living conditions. By examining the genetic codes of closely related fruit fly species, Williams is working to tease out the DNA sequences that function as switches, in hopes of understanding the changes that make one species’ switch behave differently from that of another. These switch sequences are thought to be a common factor in human health issues such as obesity, as shown in a study published last year in the New England Journal of Medicine. For example, a person’s genome sequence could determine whether they easily burn off calories or store them instead, impacting their ability to lose weight. 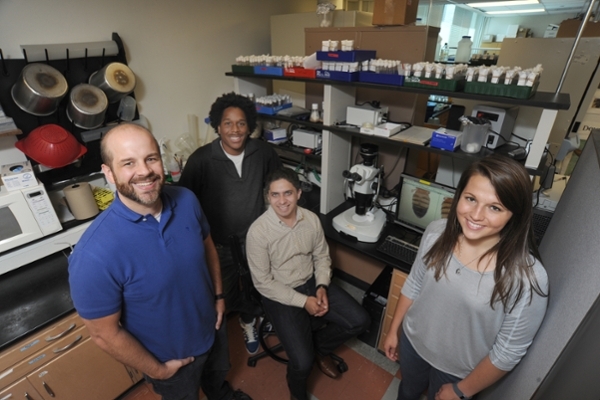 The four-year science foundation grant that started Sept. 1 will allow Williams to move forward with his research, which requires enzymes, specialized equipment to manipulate DNA and a high-end microscope necessary to visualize the activity of these switches. He also will be able to employ more undergraduate students as lab assistants during both the academic year, as well as summer months when they are able to perform research full-time. “This new award from the National Science Foundation shows the scientific community was pleased with the results from their previous funding and they are enthusiastic about what further exploration into this model may reveal about the regulation of genes,” said Mark Nielsen, professor and chair of the department of biology. Nielsen said many of Williams’ research students have gone on to attend prestigious graduate programs and medical schools, and to work as scientists and health care professionals. In 2012, Williams received a three-year, $450,000 grant from the National Science Foundation. The previous year, he received a $132,000 grant from the American Heart Association. He has published research on topics in evolutionary biology in the journals Developmental Biology, Evolution and Development, PLoS Genetics, Nature and Cell.